Back when I bought my Asus Transformer Prime tablet, my biggest motivation was the lack of a search feature on my dead tree notebook. Many a time I would sit in a meeting and just know that someone was going back on a decision or contradicting something that was fact (I'm sure you've been there). But I had no way to prove it, since I couldn't rifle through my notes fast enough. Which meant that I was often stuck revisiting decisions, redoing work -- 2 of my biggest pet peeves, along with having the same conversation over and over again. I still draw and whiteboard to get abstract concepts out of my head, though. For those, I take photos and Evernote them. Since it does OCR, they too are searchable. Win! But then this week, Evernote's latest product announcement finally seems to have caught up with my love of tech AND visual brainstorming. Their Livescribe is a pen (and special notebooks) that permit you to think on dead trees and record to Evernote at the same time. Evernote already had some special moleskine notebooks that would enable you to take paper notes, photograph them and capture them into the right folder by selecting some special features right on the notebook pages. 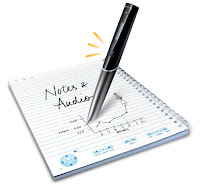 Livescribe goes a step further: the pen itself captures what you are writing, can store up to 2GB of data and auto-syncs your notes to Evernote via wifi. So then you have the benefit of carrying around your notebook and referring to your phone or other digital device in the event that you need to search. See it in action: Would you use it?